This all-time British classic makes an ideal snack, whether you’re having a lazy weekend at home or heading out to a picnic. Place the eggs in a pan of cold salted water. Mix the sausage meat with the parsley and spring onion in a bowl and season well with salt and freshly ground black pepper. Heat the oil in a deep heavy-bottomed pan, until a breadcrumb sizzles and turns brown when dropped into it. 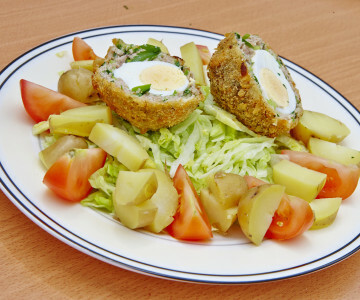 Carefully place each scotch egg into the hot oil and deep-fry for 3-4 minutes, until golden and crisp and the sausage meat is completely cooked. Carefully remove from the oil and drain on kitchen paper.